Lot 24 Brass Oval Steam Locomotive Worksplate. 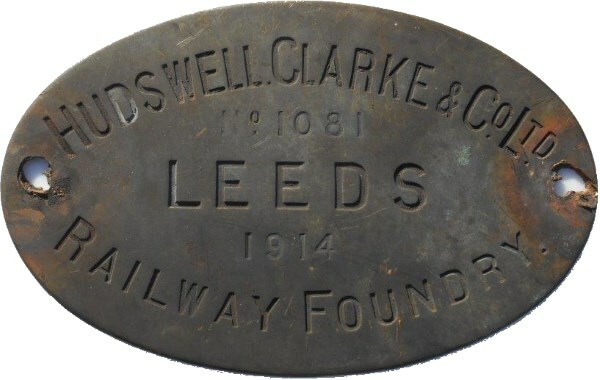 "HUDSWELL CLARKE & Co LTD - RAILWAY FOUNDRY - LEEDS No 1081 - 1914". As carried by a 0-4-0 ST O/C. New to Rowland Owen, Shunting Contractors at Seacombe, Liverpool, on closure 1945 it was transferred to Joseph Perrins of Birkenhead - Scrapped in May 1964 by Robert Smith & Son of Birkenhead. Totally Ex Loco Condition.